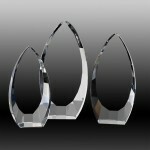 Crystal, 250mm high and 220mm wide. 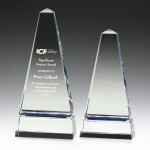 Crystal, 195mm high and 150mm wide. 30mm thick tapered crystal wave on blue pedestal and circular crystal base. Passion, Black Crystal with chrome flame.